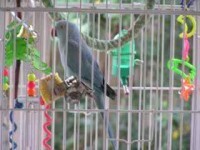 Indian Ringneck, blue-cinnamon mutation. Youth or female, no neck ring and does not seem to be tame (bites) but that is understandable due to the storm and change of conditions. Found in the street around Woodrow Wilson High School (100 S. Glasgow Dr, Dallas, TX 75214) between the afternoon storms/tornados on April 3rd. Very healthy and eating well.